The exact origin of the Dirty Martini is unknown, but like all martinis it quickly grew in popularity after Ian Flemming published the James Bond book, Casino Royal, in 1953. I was first introduced to the drink in Sun Valley, Idaho, back in 1996, I believe, when a girlfriend, Tyra Karlson, ordered up a couple of those in the Casino, an SV institution where locals hung out and searched for trouble. The thing tasted so good I had another, but that’s when I felt my head starting to go. So I switched to something lighter; a friend accompanying us didn’t—he never said no to Tyra’s offerings and by the end of the night he was a trainwreck. Which wasn’t good because this guy had elk fever worse than anyone I’d ever seen. And, we were scheduled to leave at 5 a.m., drive two hours, and trudge up a wicked mountain where the elk hang out. I’m a bad drinking partner because I wouldn’t let a hangover get in the way of hunting; I shook my friend awake the next day and said, “Just get in the vehicle. You can sleep on the way.” At about the hour forty-five mark, what do you know, a herd of elk decided to cross the road right in front of us. It’s almost daylight. We could have just sat in the truck, waited for shooting light and then followed tracks to the two raghorn bulls we saw in the group. Meat for the winter. I share that story with you as a warning—these drinks are good and they go down the hatch easy. Which may be why the Dirty Martini is also a favorite drink for those who remedy a hangover with more of the same. Not for me these days, boys, but you might try it and like it. Michelle Obama, I’ve read, typically orders Dirty Martinis (made with Stolichnaya) for she and her boy before dinner. I doubt she subscribes to the morning remedy. Ok, you can make a Dirty Martini with vodka or gin, but using vodka might be the best option. You can chill that vodka nicely in a shaker with ice, olive brine, and a little dry vermouth. Pour it in a chilled glass and you’re good to go. You can also concoct this thing and pour it over ice cubes in a non-traditional martini glass. Ingredients are key. You can’t just pour the olive juice out of a jar in the refrigerator because it’s mostly made of vinegar. Instead, you’ll need to invest in a pure olive juice, such as Dirty Sue’s or Saucy Mama’s. You should think of premium olive juice as saltwater—go easy on it. 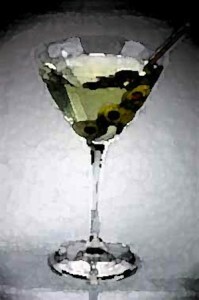 For a clean Dirty Martini you can use pitted Mazanilla martini olives. Here’s the recipe and method. Hope you enjoy one of these today for a Friday lunch. Pour vodka, dry vermouth and olive brine into shaker. Add ice. Shake well. Rub the rim of a martini glass with a wedge of lemon. Strain and pour contents of shaker into a martini glass. Take a big, big sip. This entry was posted in Cocktails, Drink of the Week and tagged Cocktails. Bookmark the permalink. You’d be in trouble if I were there. I wrote that post at eight this morning and I’ve had trouble keeping my mind focussed since that time. Blue cheese. Yum. Martinis. Yum. Make it a three-martini lunch young lady, and celebrate the weekend. Happy Friday Greg, This is a great drink with extra “sneak up on you” capabilities. User beware. Save yourself a step and try to find Tipsy Olives. These are olives preserved in vermouth. Use the brine for both vermouth and olive juice. Dirty done quick. Thanks for the tip. That sounds like something I’ll try. I tell you, writing these drink of the weeks doesn’t do much for abstinence. Is it five-o-clock yet? Does it matter. Thanks again for the kind words. I’m posting more as a wondering if we will see more drinks of the week in the future. I’m thinking a dirty martini might be pretty good right now, but, that Sierra Nevada Rye IPA was pretty good….Drinks of the week need to come back strong. Yes you will, if you survive for a while longer. Something with absinthe next, I think. Using vodka instead of gin technically makes it a kangaroo, not a Martini. Although purists will scoff further, I’ll go with vodka Martin or even vodka-tini. But a Martini’s base liquor is always, always, always gin. Technically yes. But I’ll take it with either. Thanks for the comment. My dad used to drink dirty martini’s after work. I can’t officially say when I tried my first. Pretty sure D-Sum was exposed to them before he was legal. Love the site! Very nice. Could use one right now.